Happy New Year!! 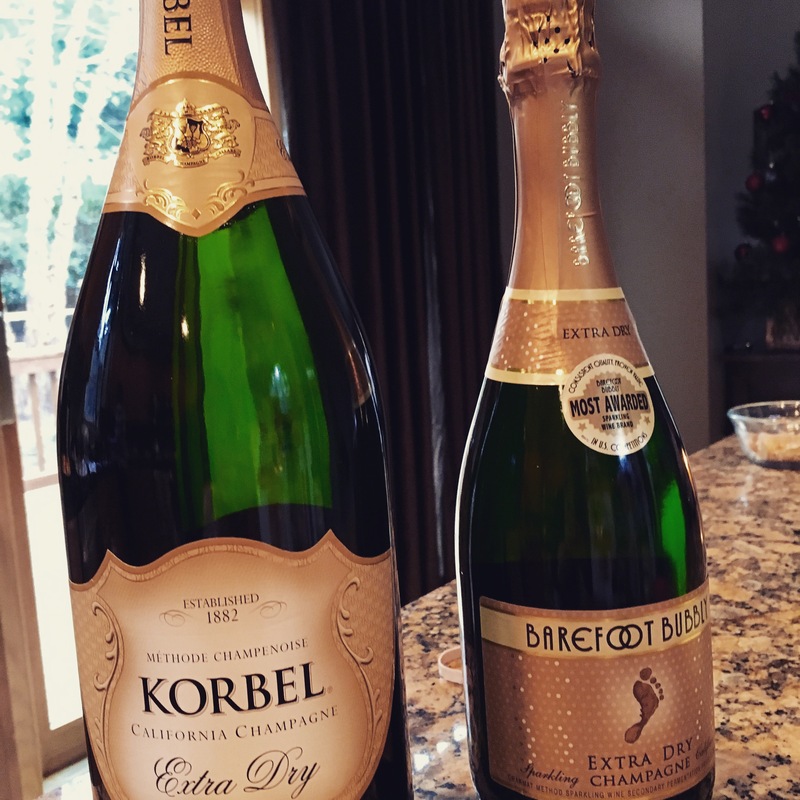 The Feast of New Year’s Eve… – Eat, Drink, and Go! What is all this? All this is just some of the things my mom, my sis, and I put together to entertain ourselves and loved ones. Low key with the crowd, but upper crust with the eats!! And with a respectable amount of champagne to wash it down. 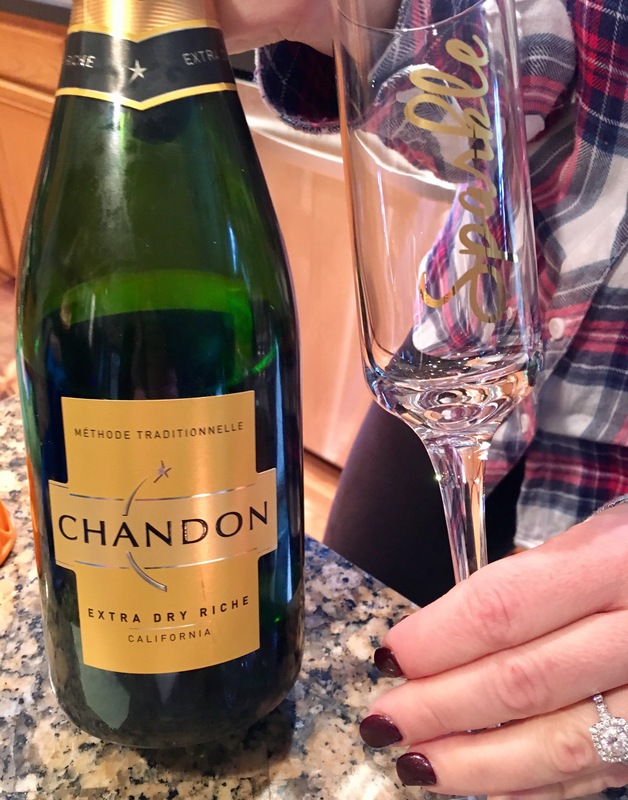 The champagne was free flowing, and we went with a variety. Sometimes we had them straight, sometimes we splashed in a little flavored vodka – hey, we had a lot of time to be indulgent and the night was young!! 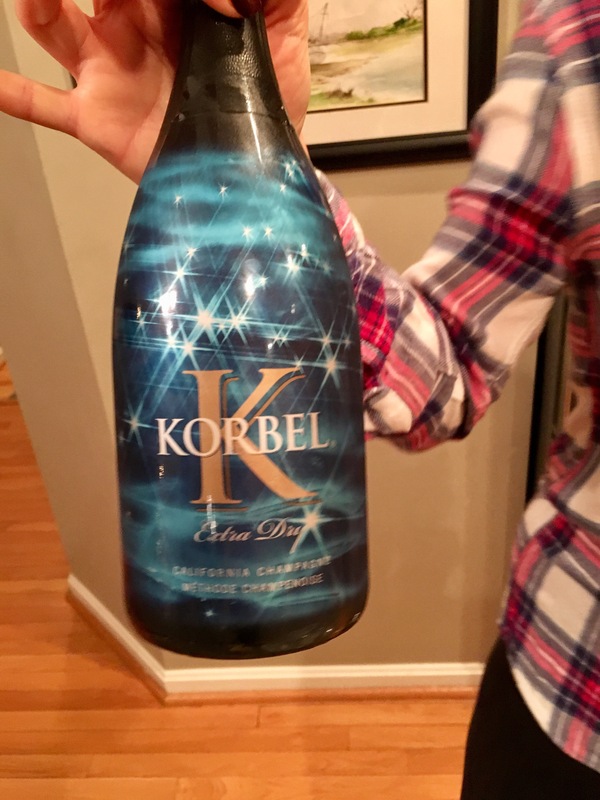 And there’s no judgment on how much you drink on New Year’s Eve. You will pay the price on New Year’s Day, so judge not lest ye be hungover. Be sure to start alternating in glasses of water! 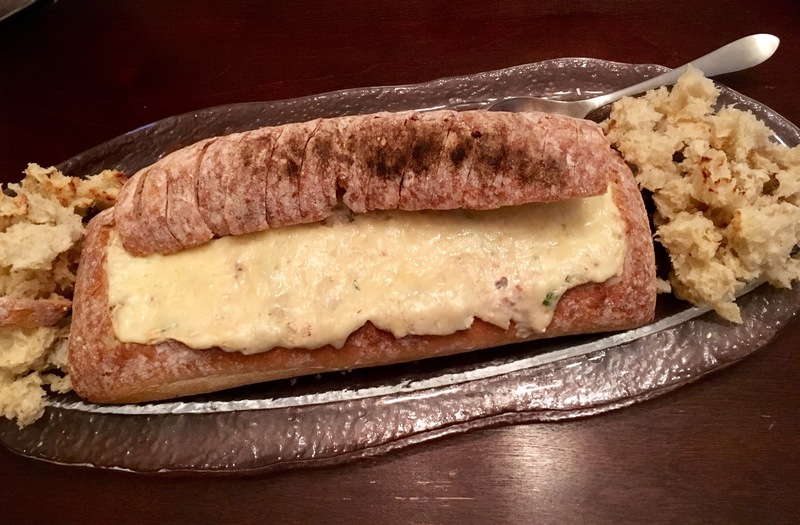 One dish I wanted to make was a bread boule with salmon dip inside. 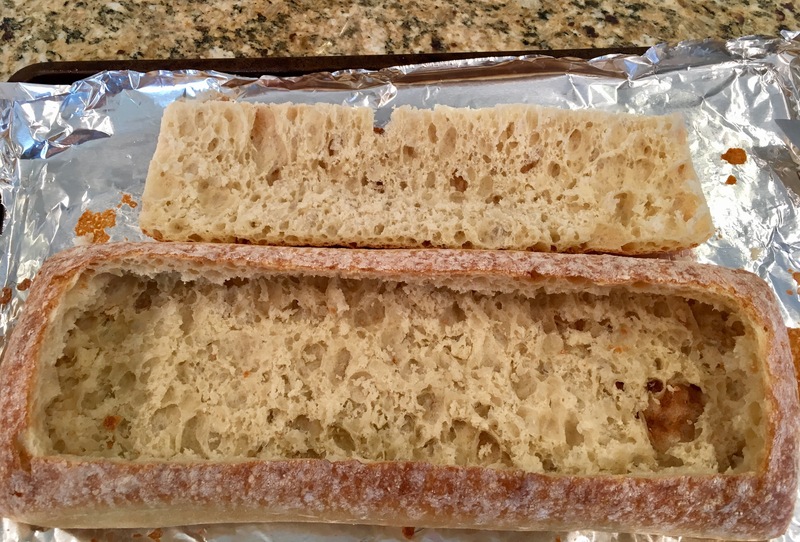 But I decided to be a little different and instead of round, I went rectangular – a ciabatta! Why-notta? This was fun. 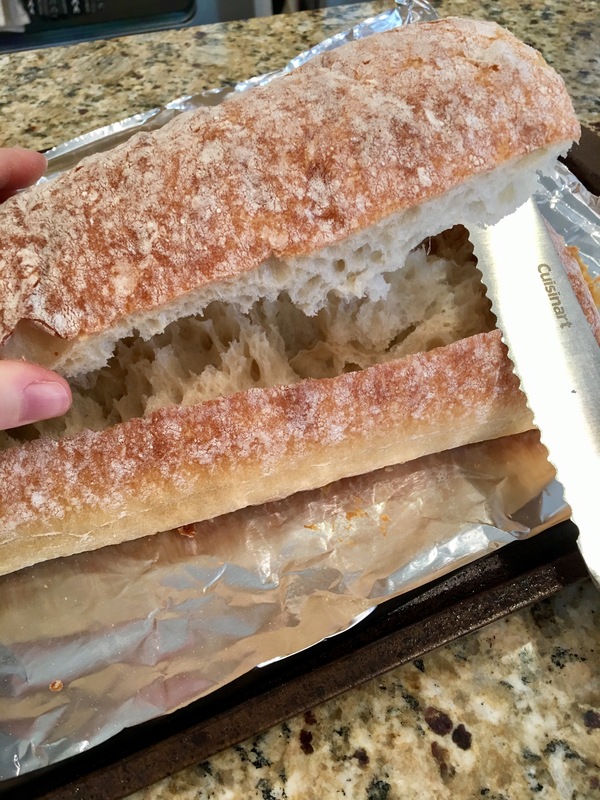 I made a clean cut with a sharp bread knife and scooped out the insides. 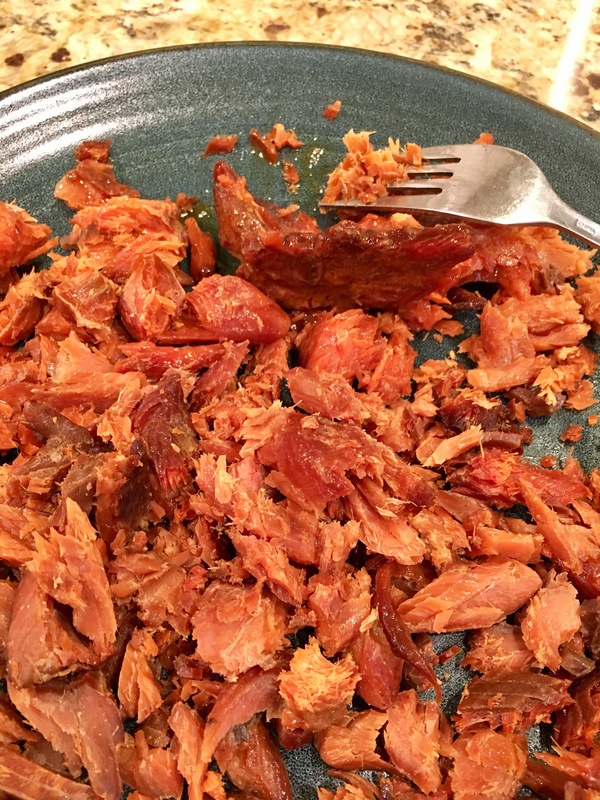 The dip began with a home-canned smoked Alaskan salmon. It is ridiculously amazing, no bones, and not over salted. All you have to do is fork it apart. This Alaskan deliciousness makes amazing salmon dip, but I’ve used it for salmon burgers too. 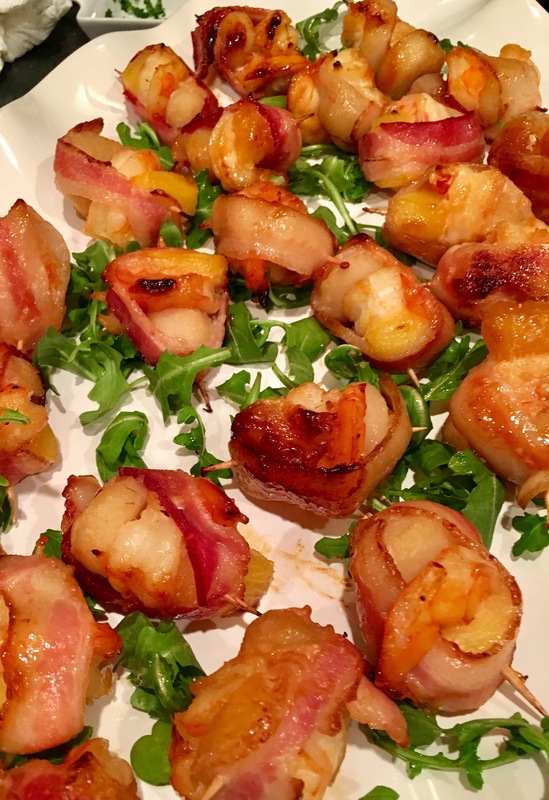 I wish I could say where you can get it, but it’s not even on the market…it is homemade. One brick of cream cheese, softened, then mix together with the salmon, add some sour cream and a little milk to thin it. I went tangy, so I added some truffle mustard from Olivier (see truffle chicken blog). Then I decided to do it hot, so fontina seemed like the right cheese for that. It came out insanely good!! The best in show was a creation by my mom, a fabulous foodie as well, and she still hasn’t decided what to call it. A take on rumaki, we think. Whatever, it was incredible. 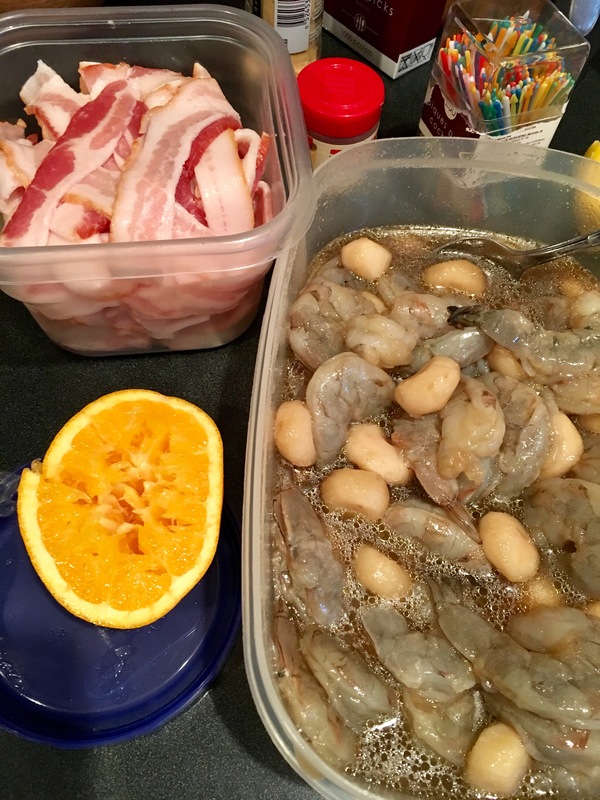 She marinated shrimp and water chestnuts in a citrus marinade, heavy on the orange and ginger. 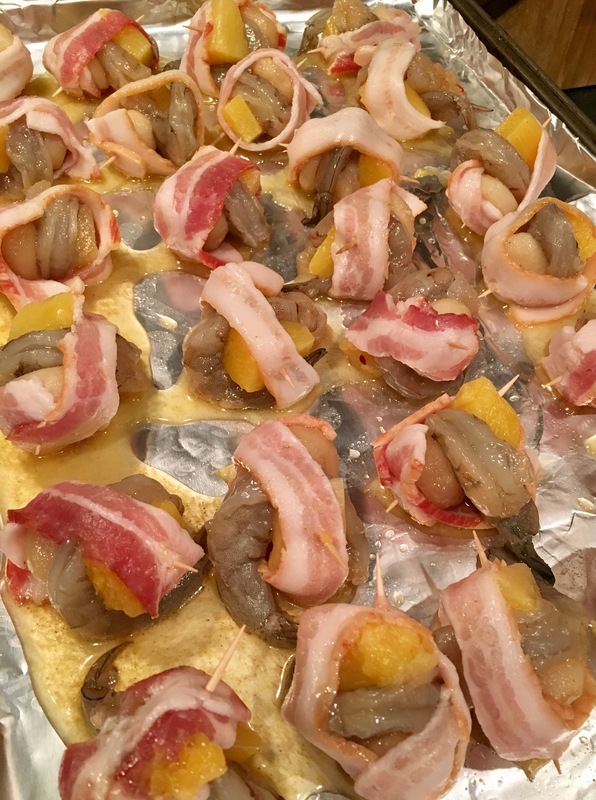 Oh yes, that is bacon – the wrap consisted of a shrimp, a water chestnut, and a chunk of pineapple, all lovingly embraced by a blanket of bacon. The flavor combo was a 1, 2, 3 punch to the tastebuds and was just the perfect sweet, salty, savory flavor balance with just as many textures! What a mouthful. Loved it and couldn’t get enough of it. 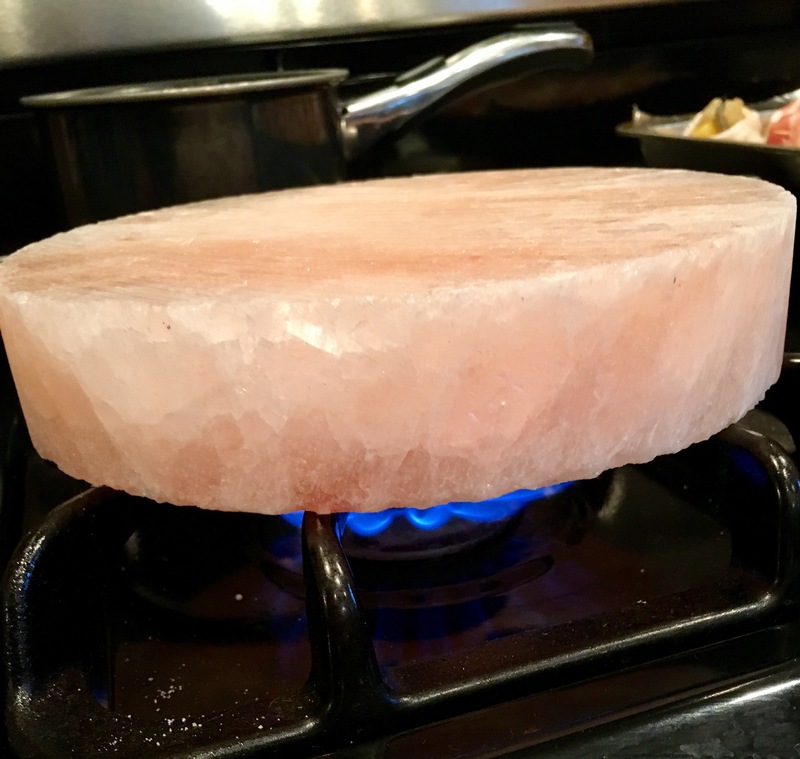 Then there was a new guy in town – my new Himalayan salt block. I got it a while ago and hadn’t used it yet, so I was determined to make this part of the feast. You heat it slowly and then it becomes your searing surface. So cool!! 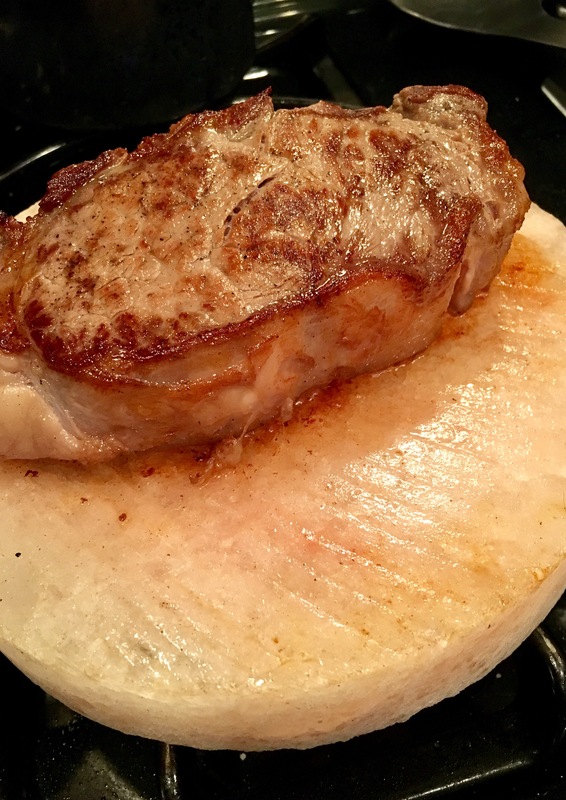 I went with a super thick NY Strip. It was so fun to cook on this!! And it give it such a nice natural salt flavor, but not too much at all. In fact, much less salty than I expected. 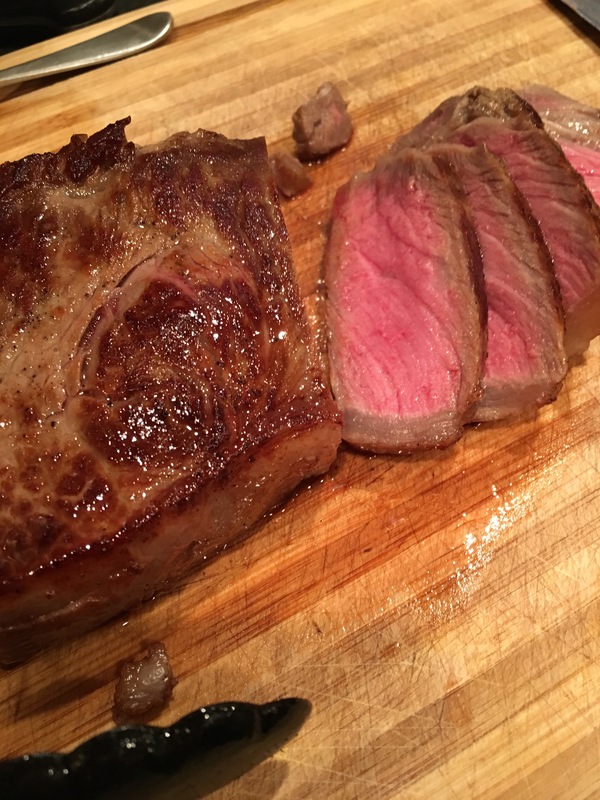 The searing ended up being perfect to a mid-rare, just how we like it. I gave it about 4 minutes on each side. So juicy!! 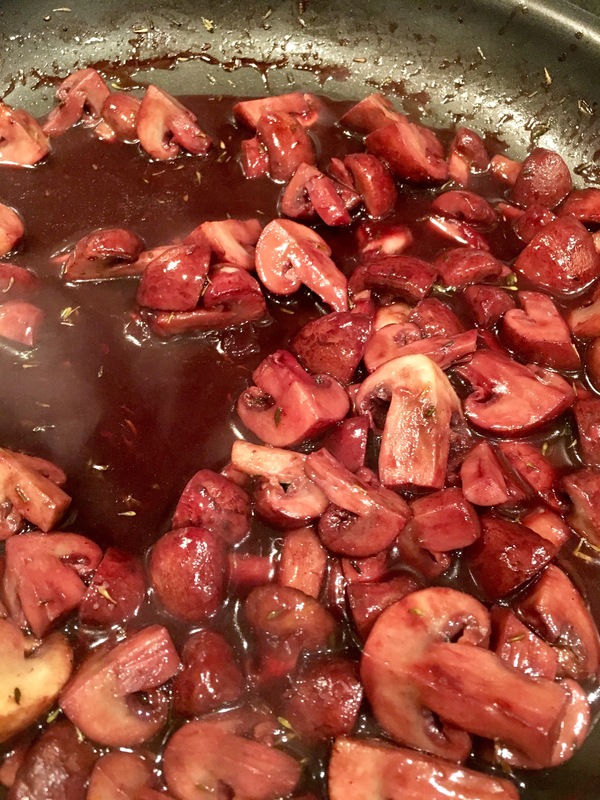 We made a red wine mushroom reduction to spoon on top. 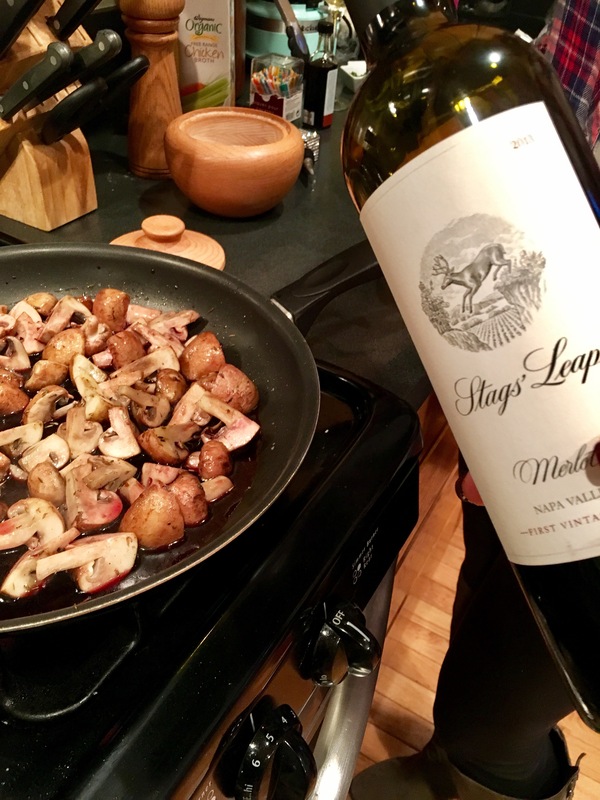 Poor us, only had an awesome Stag’s Leap Merlot on hand…Luckily tonight was the night of decadence. And of course there had to be a rawness to all this, tuna tartare was the selection. 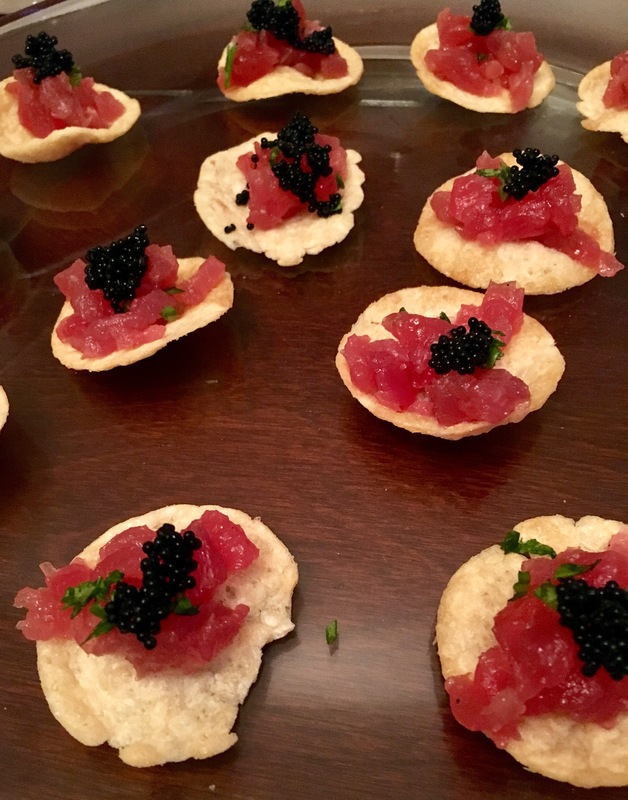 A nice cubing of tuna, tossed in truffle oil and placed on a pop chip, with a little arugula and a dollop of caviar. Whoa is right! But this wasn’t nearly all. Of course we had the cheese board. 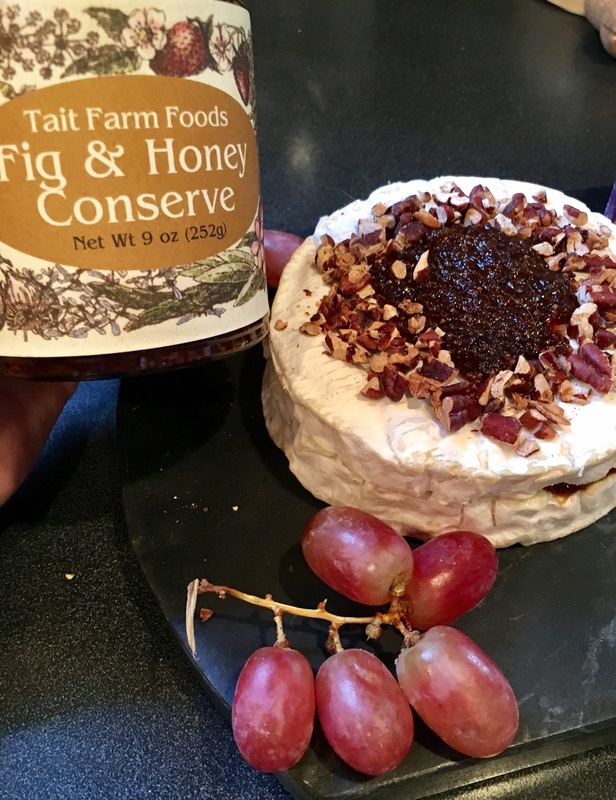 A Camembert with Tait Farms Fig and Honey Conserve. This spreadable is so good, it’s like biting into a fig dipped in honey!! I put it in the middle and on top of the Camembert with some chopped pecans. 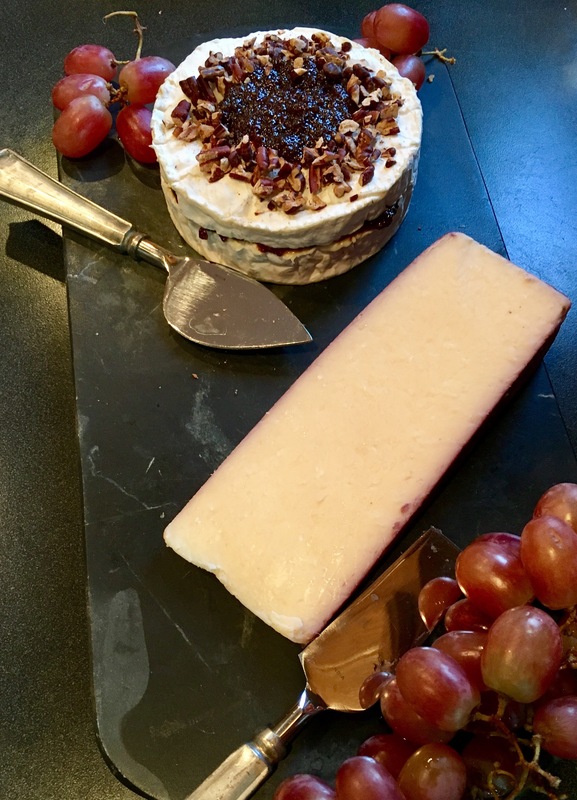 Along side the Camembert, I placed a wine-soaked cheddar that I found at Wegmans recently and just love. Crystalline, which I love in a hard cheese. No, this was not the extent of the cheese for the night. 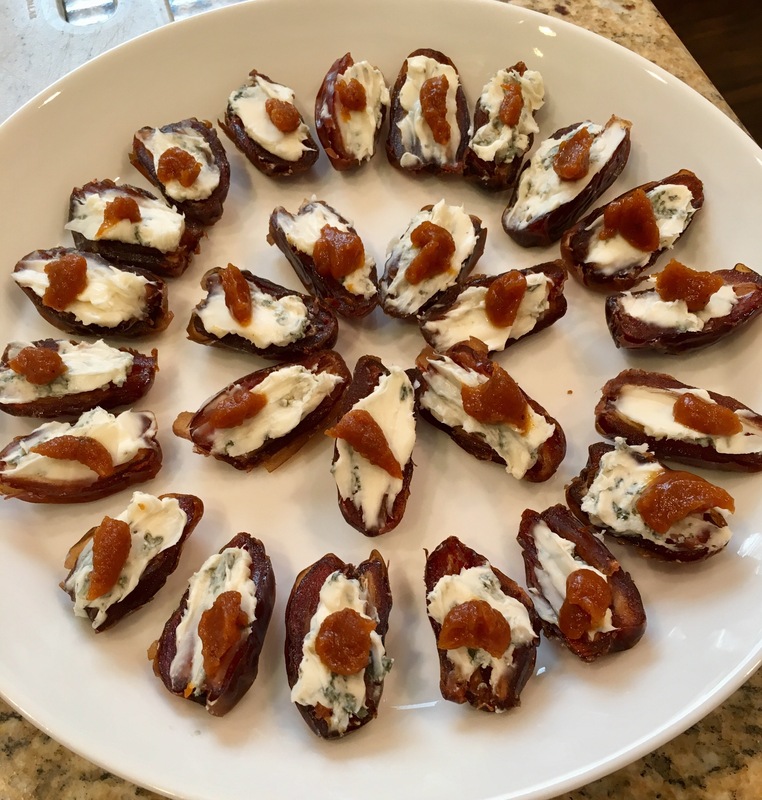 I also made Gorgonzola stuffed dates. This is easy and fabulous. Cut the dates in half, take out the pit, stuff the Gorgonzola into each half. Then dollop something fun on top. I used a pecan pumpkin butter this time. Easy-peasy and never leftover. The last cheese star was the truffle burrata. 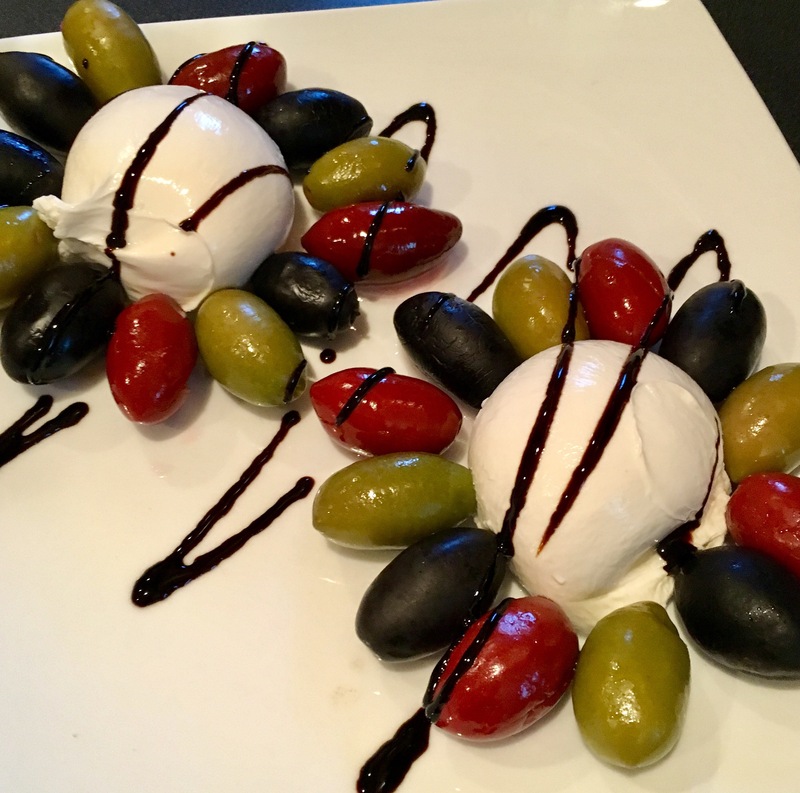 We added some beautifully colored olives around it and then drizzled a truffle balsamic glaze on top. Gorgeous and delicious! 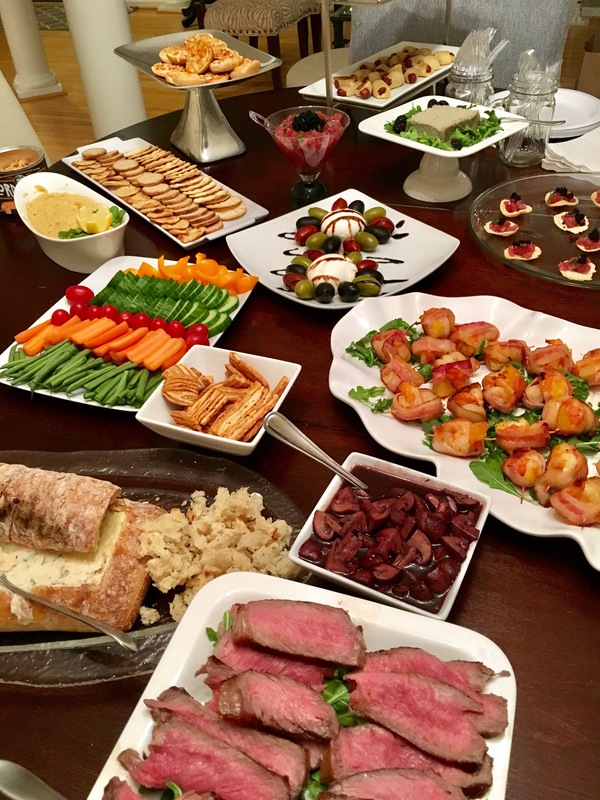 We filled in with some kid-friendly food like pizza bagels, pigs in blankets, and hummus – yes, kids love hummus. Fancy sodas and sparkling cider for them. And copious amounts of champagne for us, but I think I already mentioned that! We capped off the night with chocolate raspberry sauce to dip berries in. 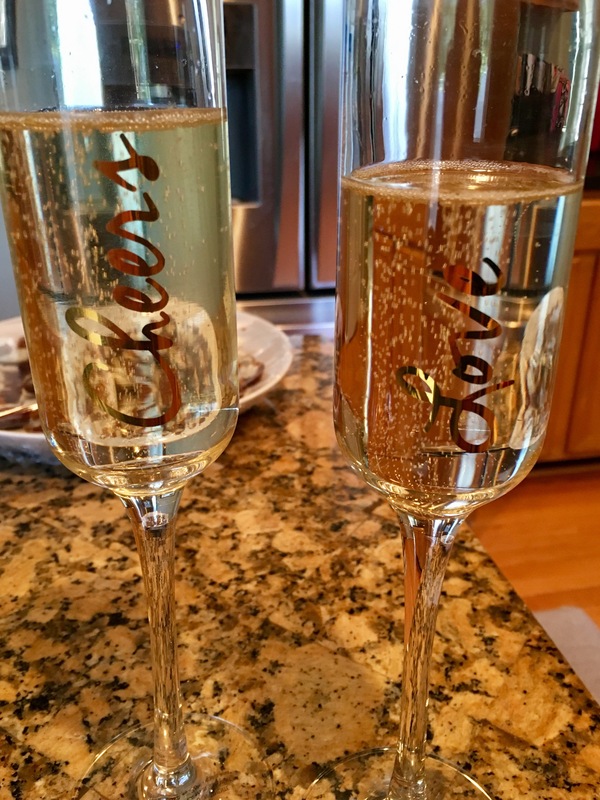 Missed the photo op for that because, well, we had had a lot of champagne by then. 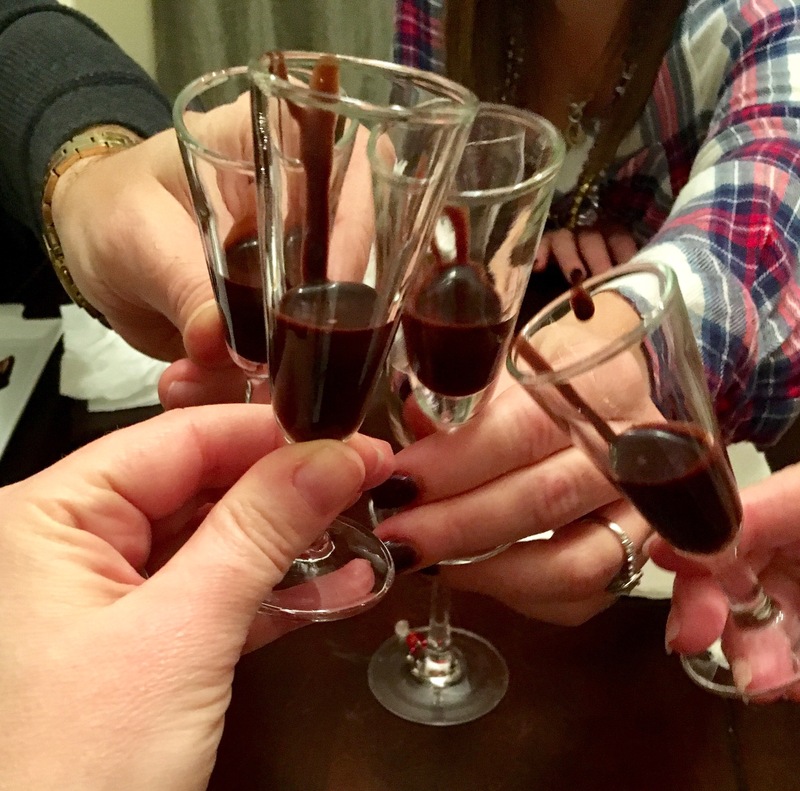 But with the last of the chocolate raspberry sauce, we did one last shot for the evening…a chocolate shot! 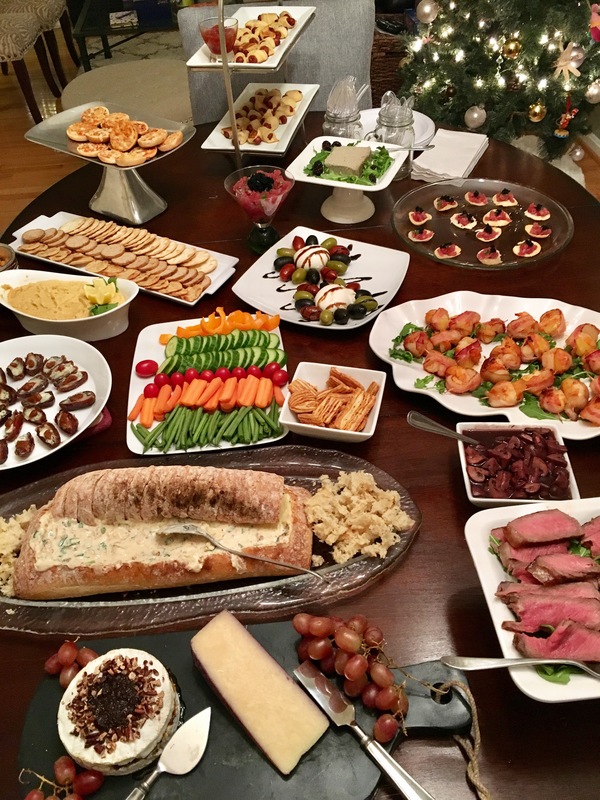 One more look at that spread…oh yes, there was also some awesome orange Cognac duck pate from Alexian, some extra tuna tartare with caviar just in a dish, and some nice crunchy veggies! Looking forward to so much more cooking, eating, mixing, drinking, traveling, and writing about it in 2017. I hope you’ll join me in another year for some great Eat, Drink, and Go! !